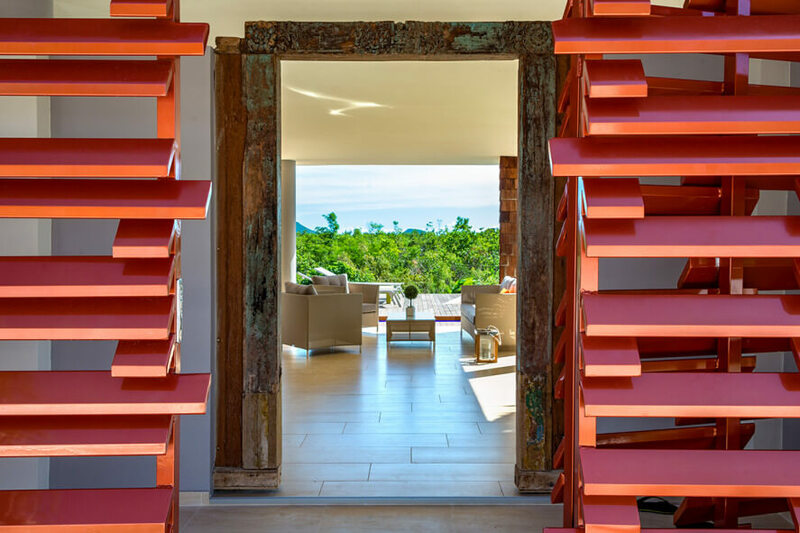 The moment you arrive at Bahia Blue’s artful contemporary gate; you know you are entering a most unusual space; a designer’s dream. 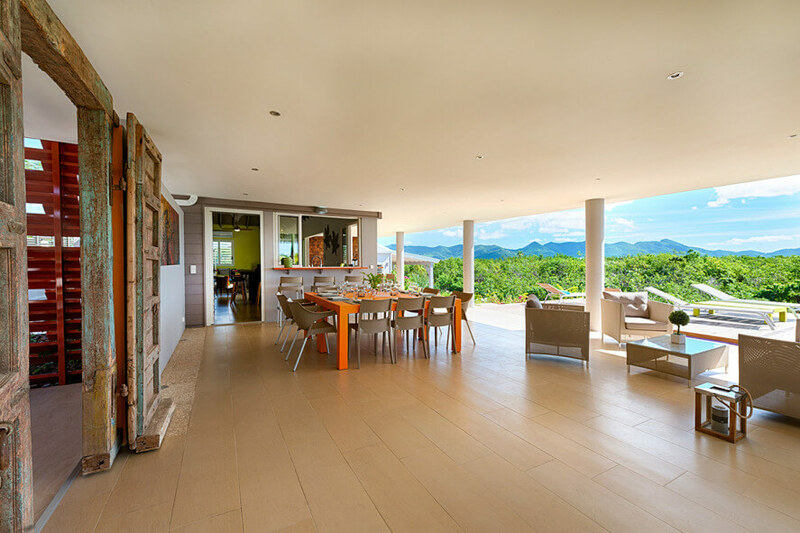 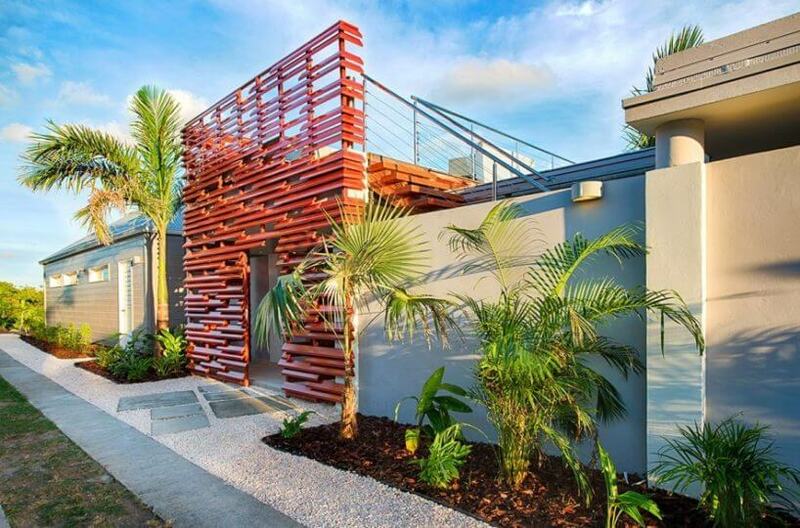 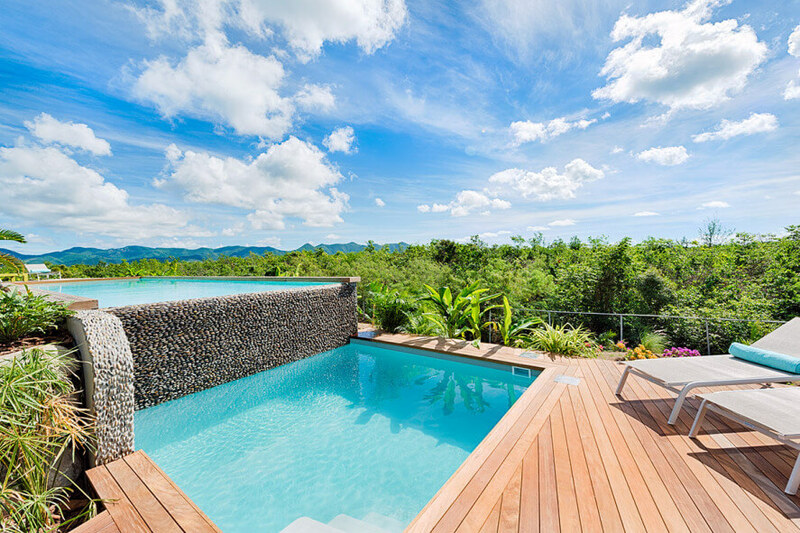 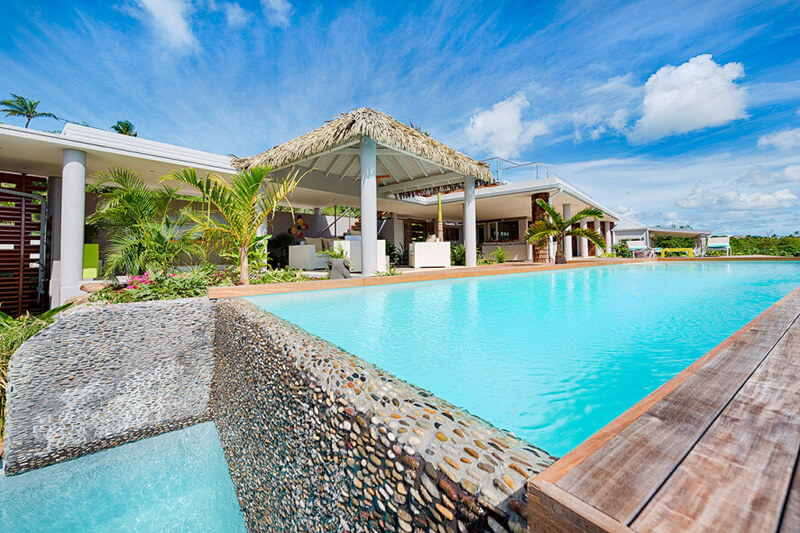 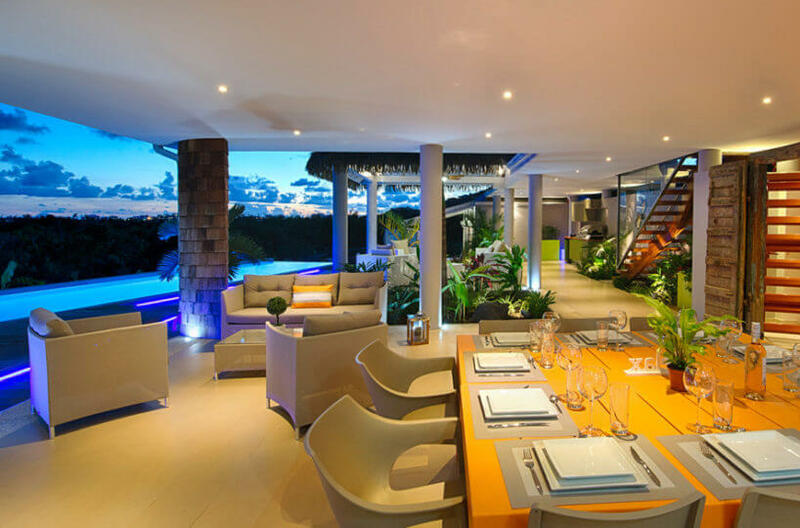 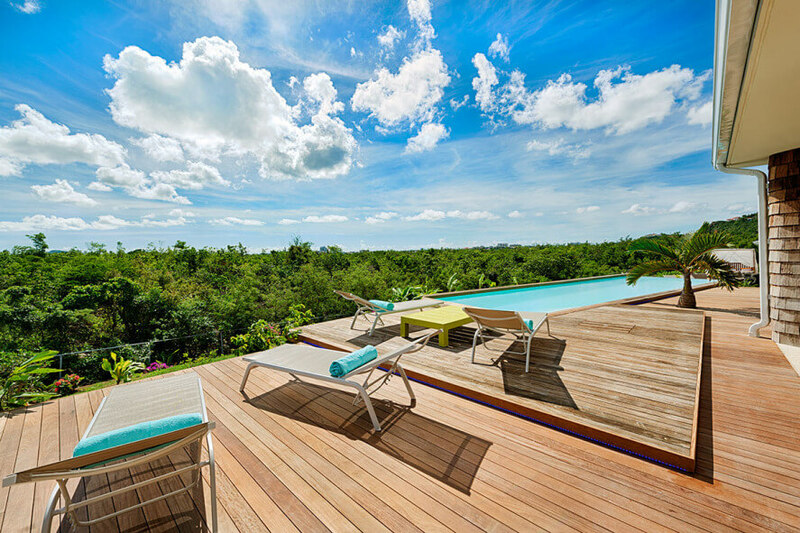 The house is a superb, modern adaptation of a stylish tropical retreat. 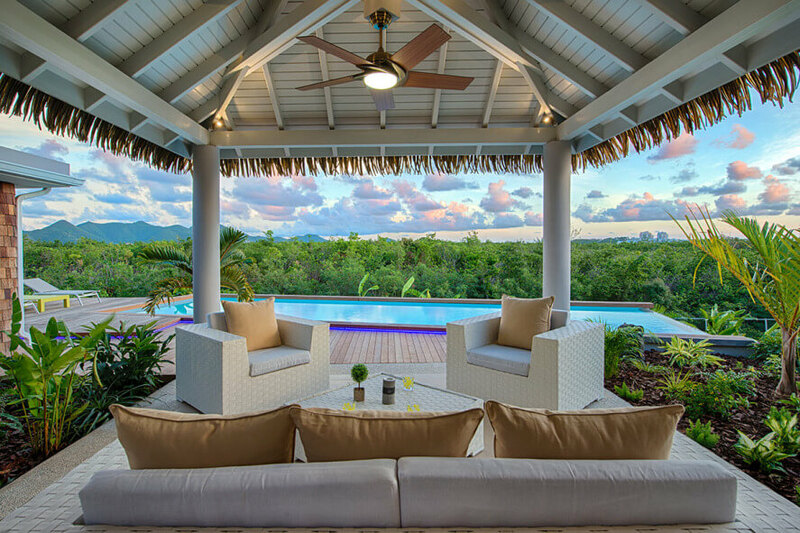 The villa exterior is a visually delightful blend of elements in soft greys, white and mango; a perfect backdrop for one of the most gorgeous landscapes on island. 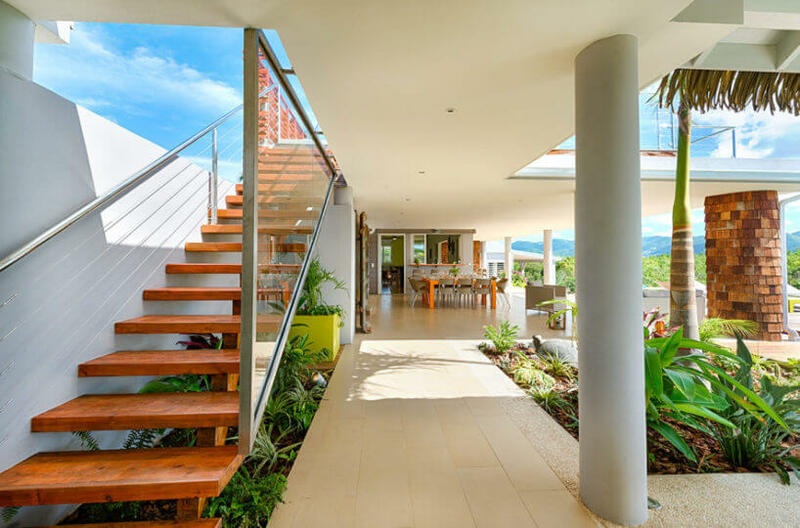 Seamlessly blending with its surroundings, this is a Zen like place for people who love nature, tranquility, and stylish architecture and design. 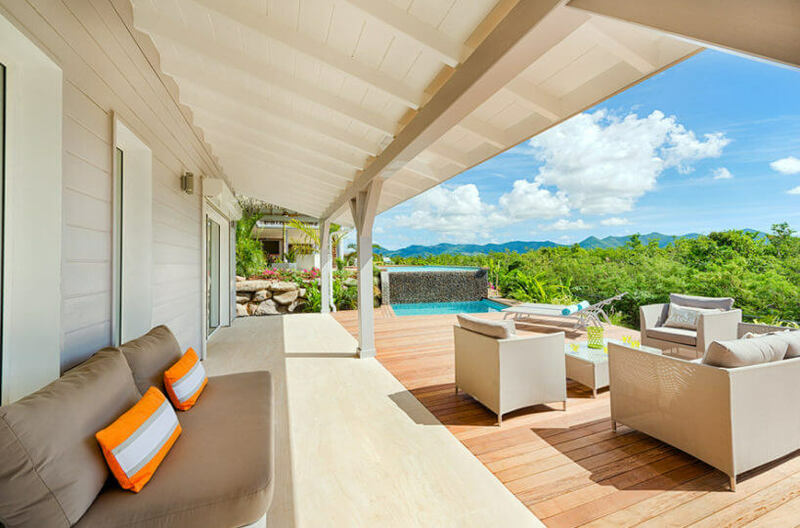 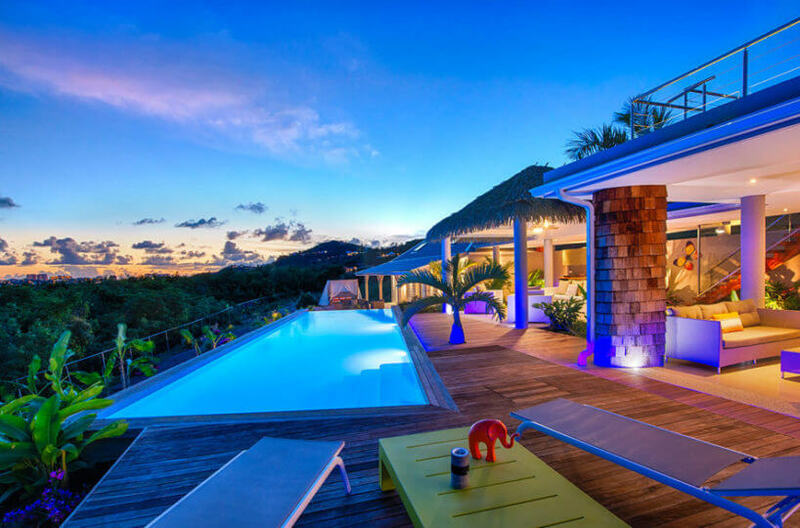 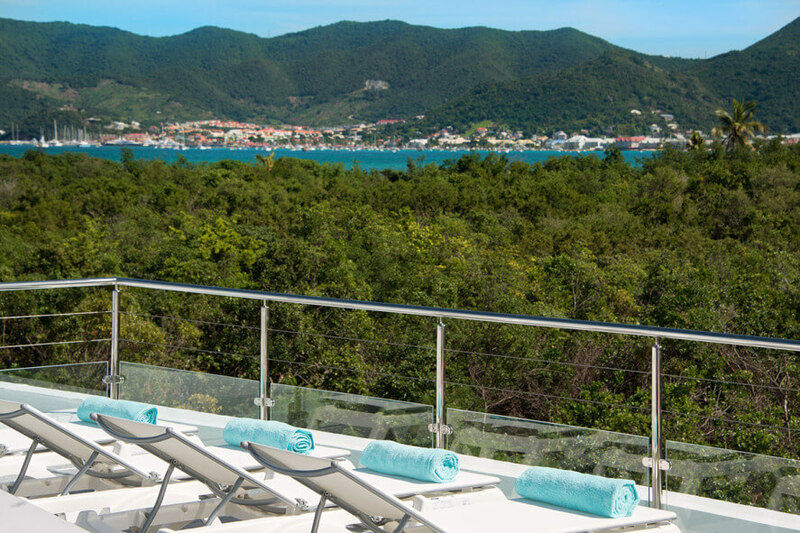 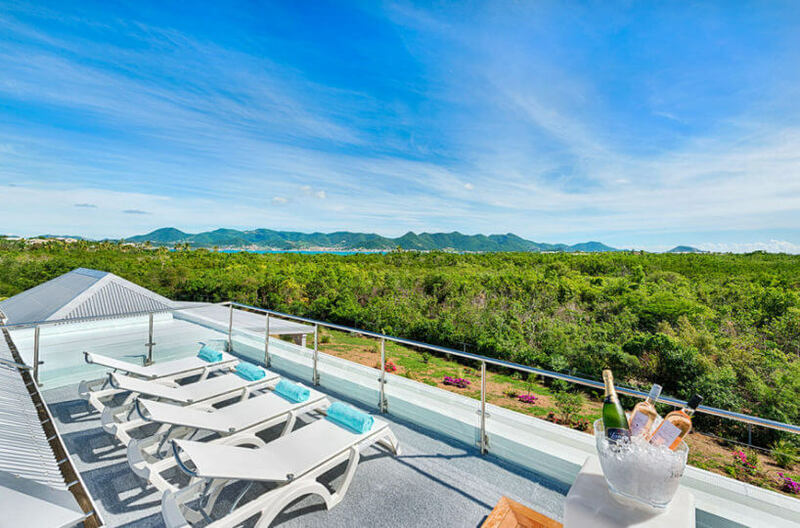 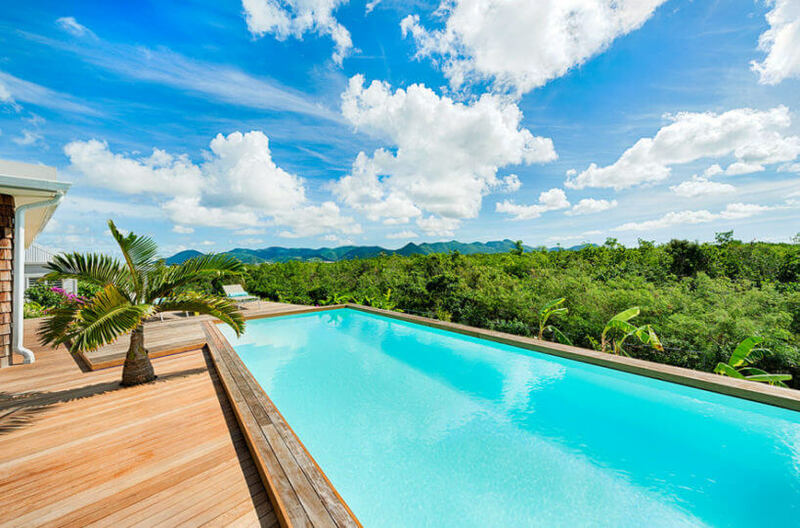 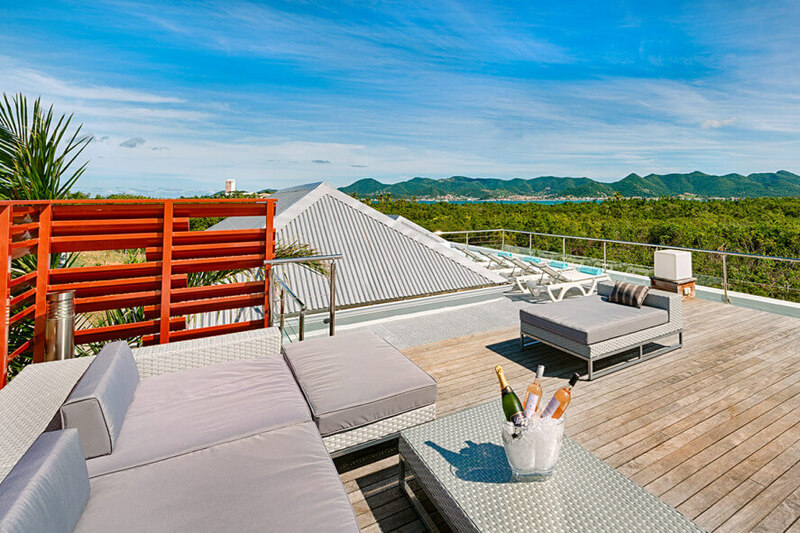 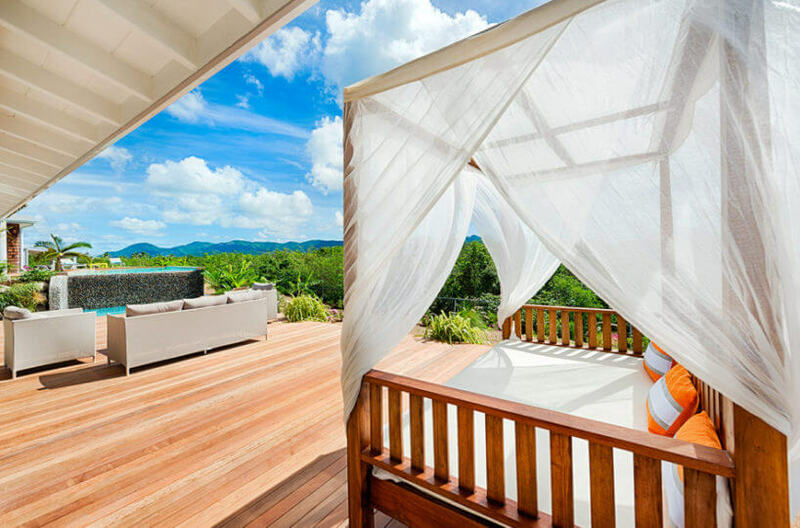 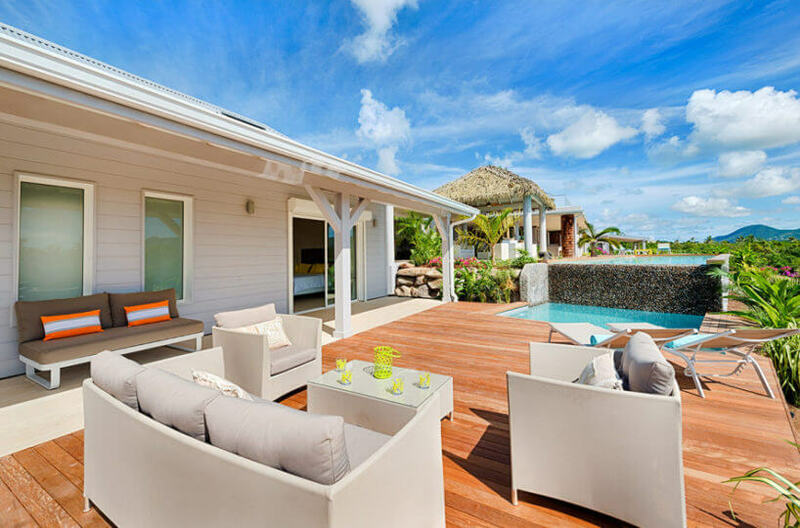 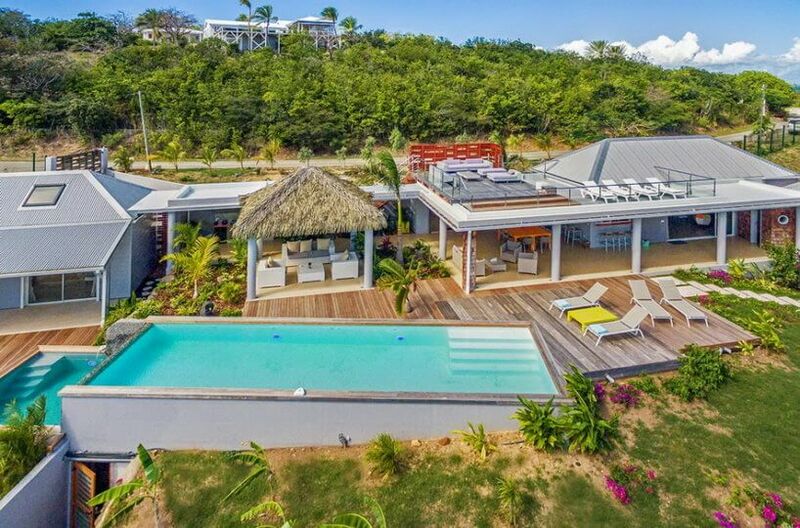 Entering the villa, the stunning views showcase the verdant mountains and tropical forests of St-Martin and for a breathtaking sea view, head to the roof lounge. The interior is as visually pleasing as the exterior. While contemporary, the house is warm and inviting with a continuous transition inside to outside. 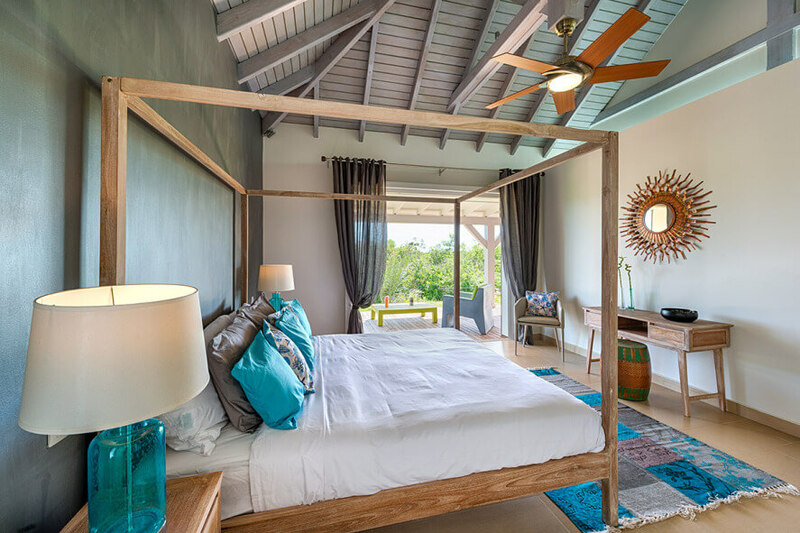 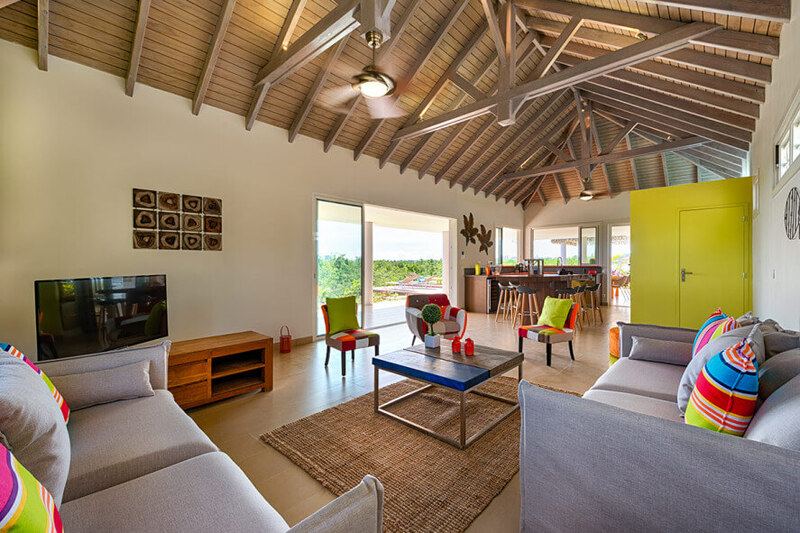 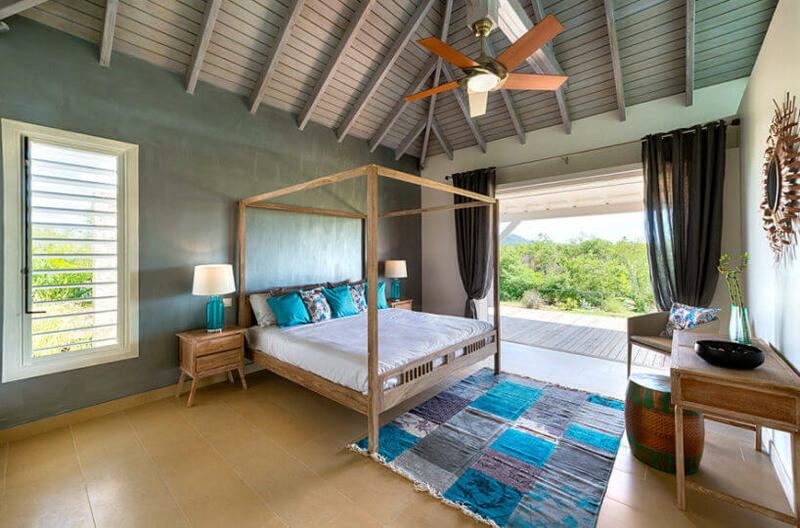 Throughout the living spaces and bedrooms, lime, mango, grey, turquoise and cream blend with tropical woods create a serene space complementing nature. The living room is a color feast combing all the villa’s beautiful colors into one space. Texture wood-like tiles, river pebbles and Epi wood flow under sleek, comfortable furniture. 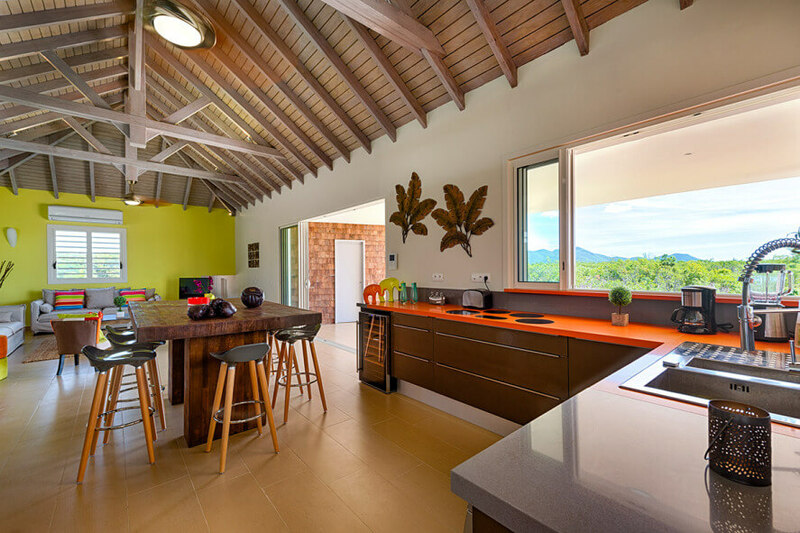 The well-equipped modern kitchen opens to the view and the al-fresco dining area. 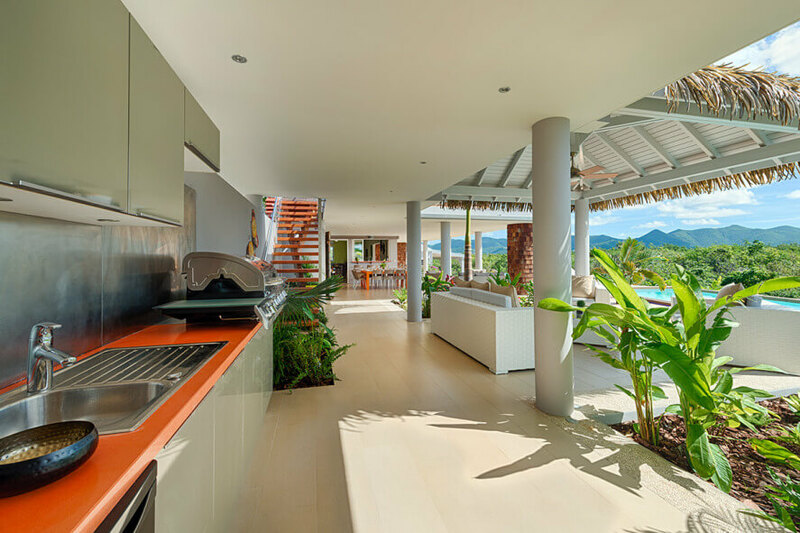 A fully equipped outdoor kitchen features the barbeque. The four equal sized bedrooms are at each end of the villa, connected by walkways. The rooms interconnect making it a perfect house for families with young children but they also lock for privacy when rented to couples. 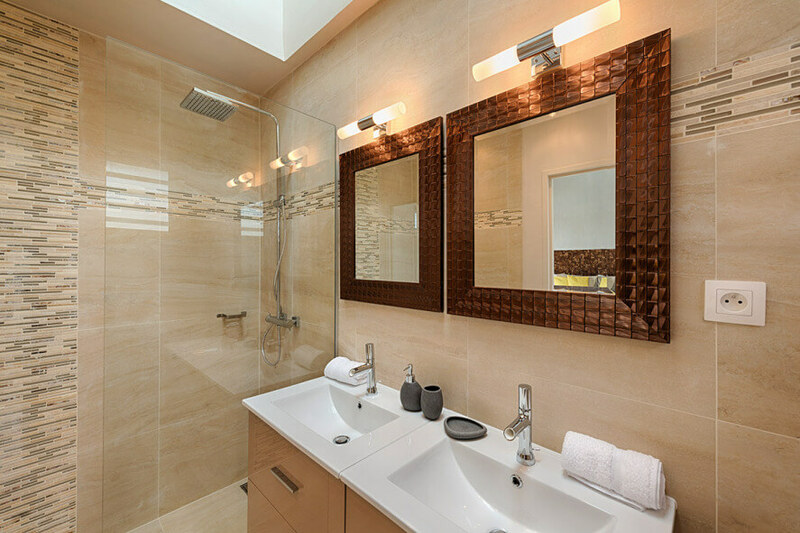 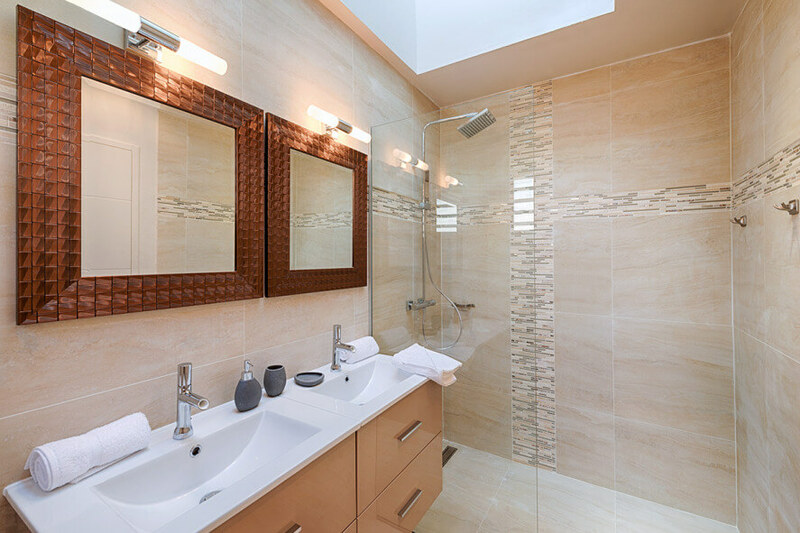 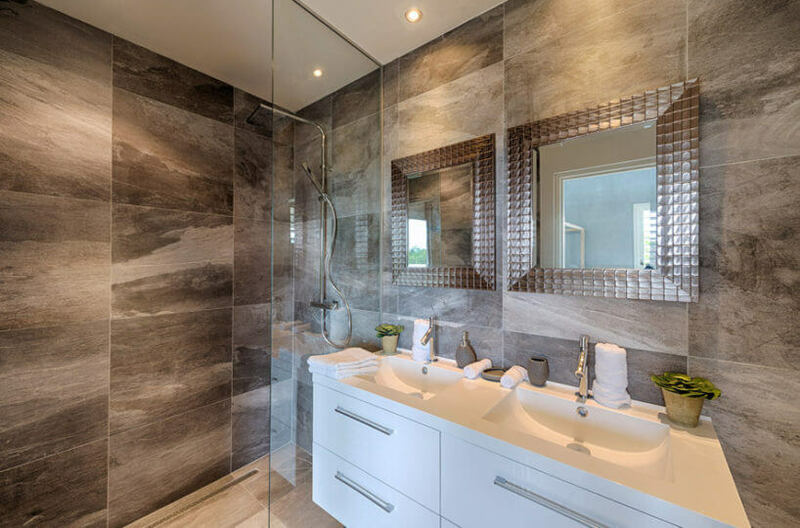 Each spa like bathroom is clad in serene grey marble accented with gloss wood and steel. 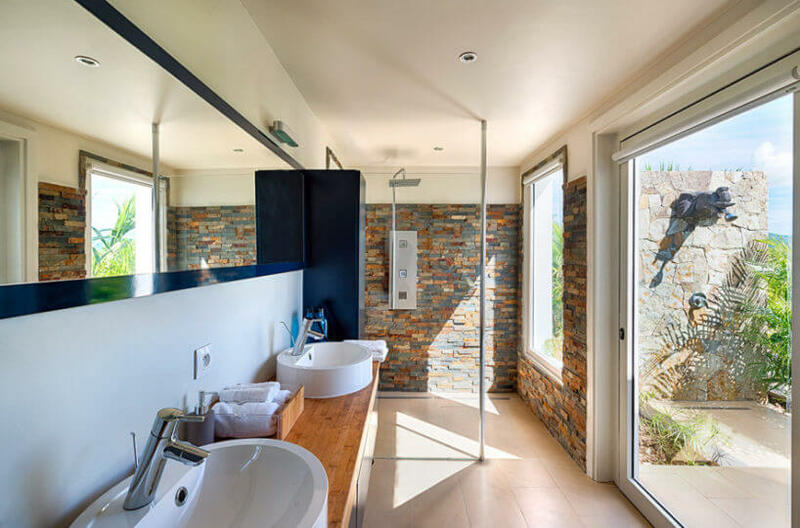 The bedroom near the hot tub has an outdoor shower. 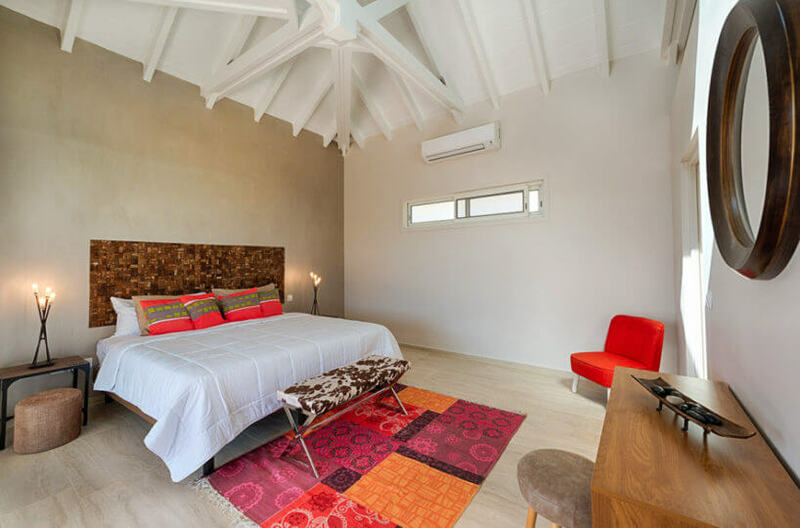 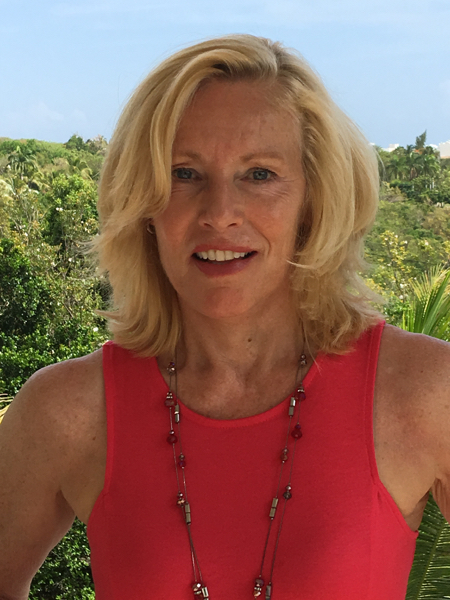 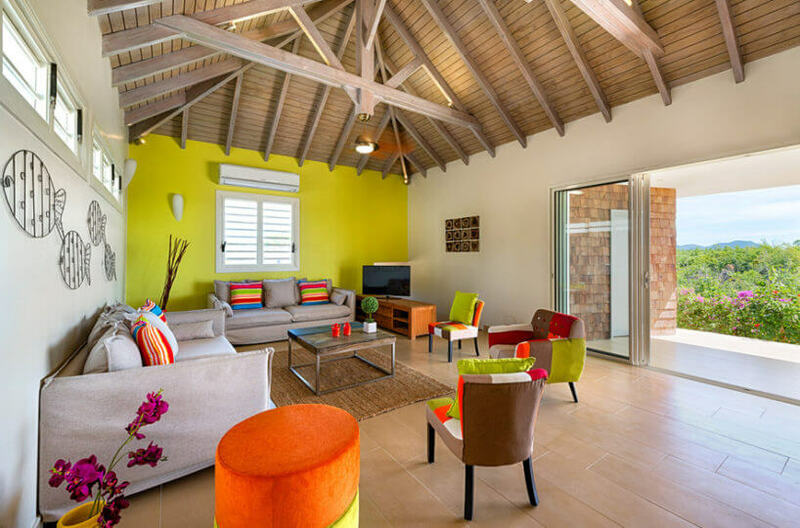 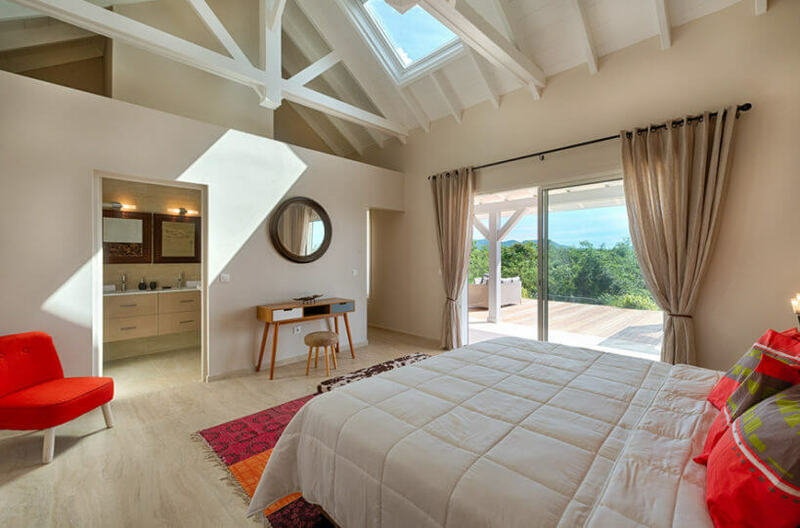 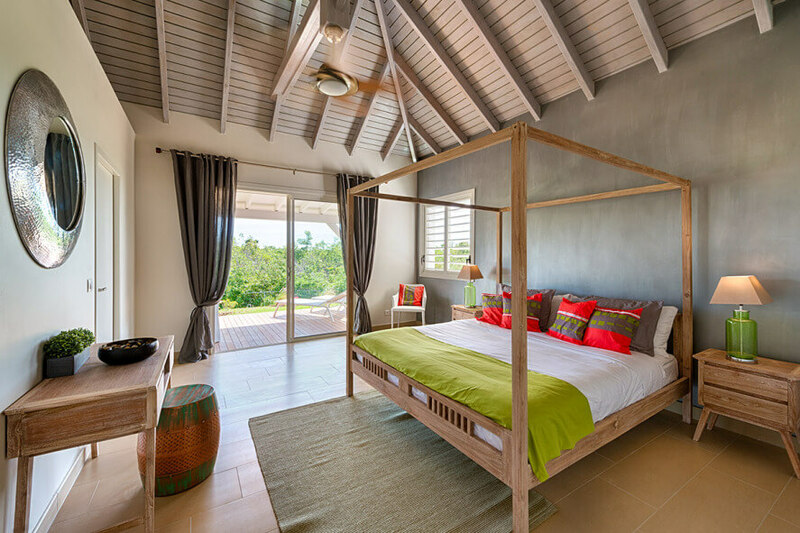 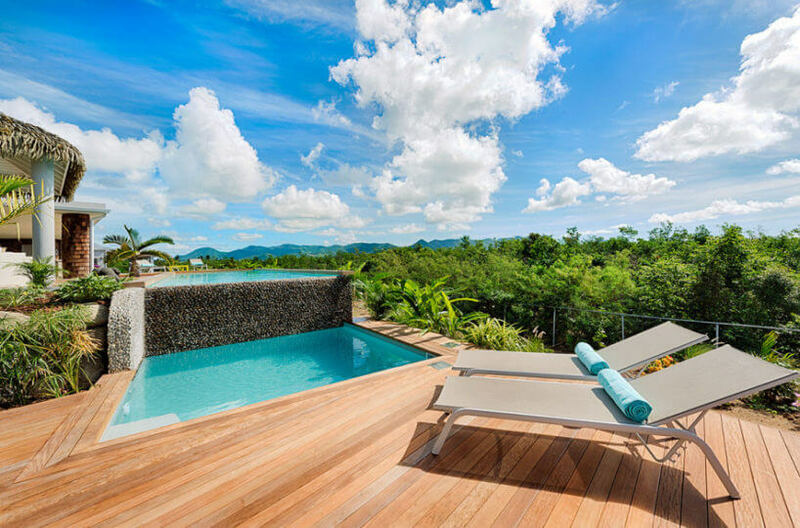 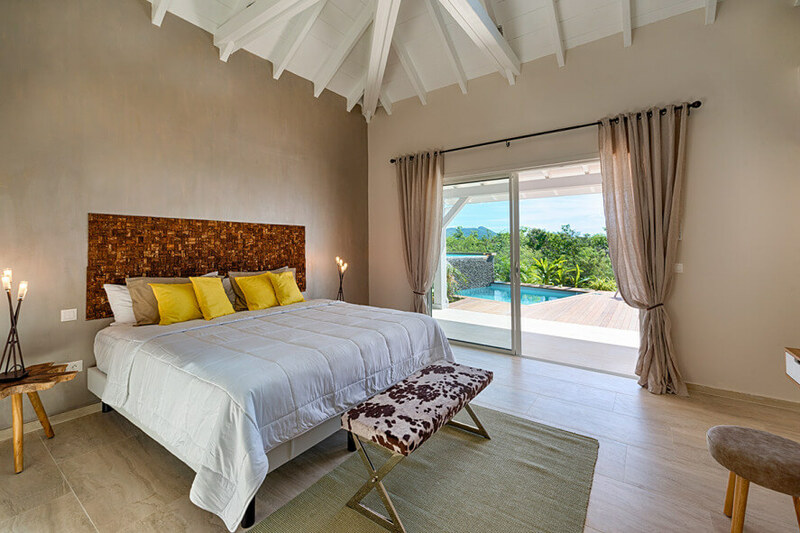 Although the villa appears quite remote, you are just a ten minutes walk to Baie Rouge Beach and a two-minute drive to Baie Nettle for fantastic restaurants, 10 minutes further and you arrive at the charming French capital of Marigot. The airport is only 15 minutes away and Grand Case and Philipsburg only 25 minutes by car. 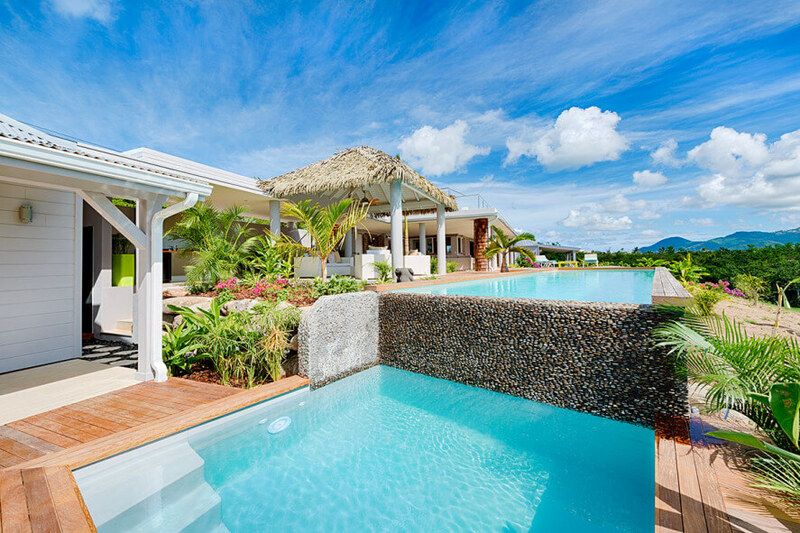 Can now be rented as a 2-3 or 4 bedroom villa ! 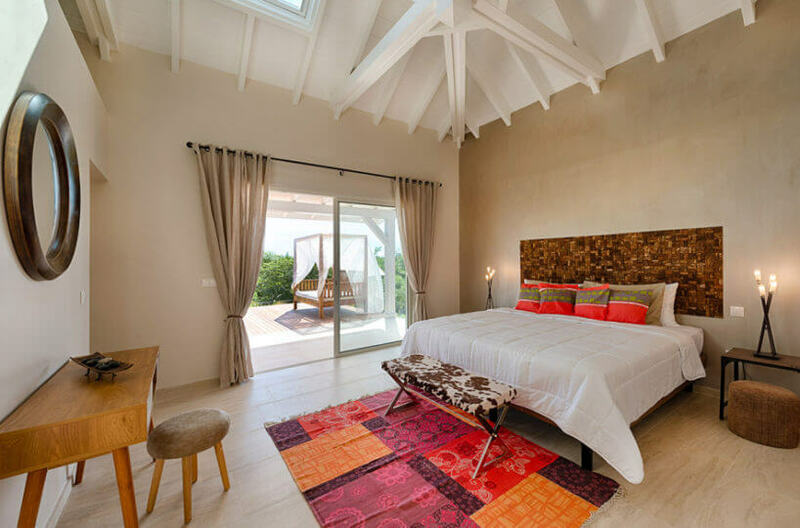 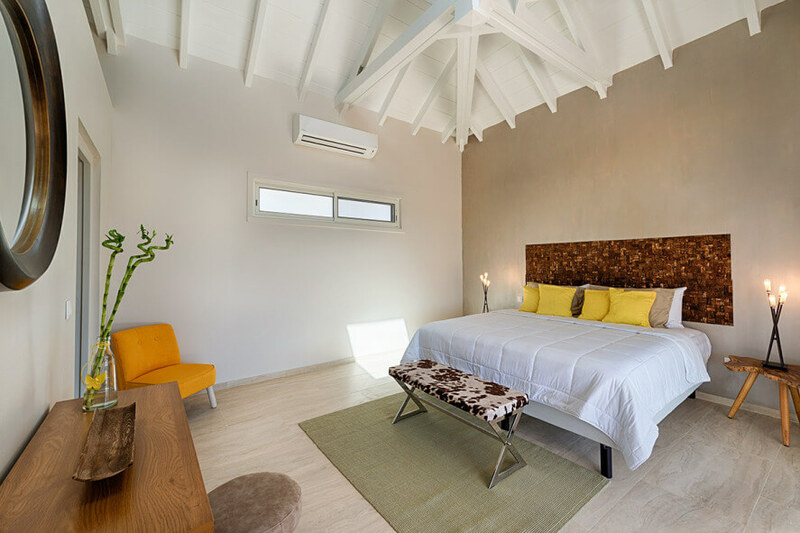 The four equal sized bedrooms have king size beds and their own private en-suite bathroom. 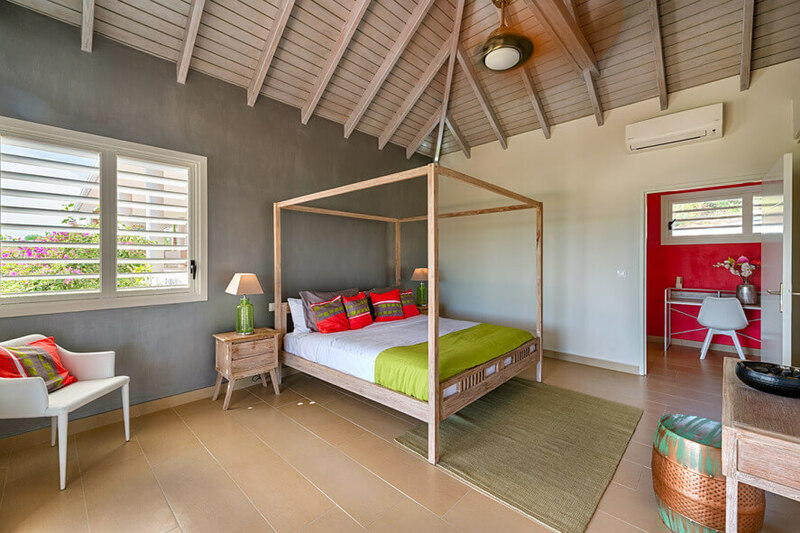 The bedrooms have connecting doors, which is great for families traveling with young children, but provide privacy once the doors are closed and locked. There are two outdoor showers which enhanced your private oasis experience. 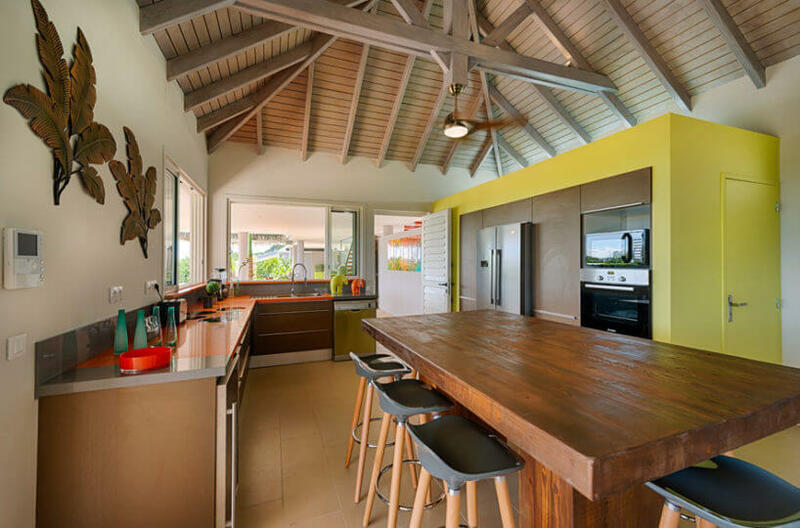 The kitchen has direct access to the outdoor dining and there is a beautiful integrated wooden kitchen dining island. The outdoor kitchen with BBQ is part of the outdoor covered gazebo where you will find the dining area and a comfortable seating area to unwind with an after dinner Irish or French coffee. 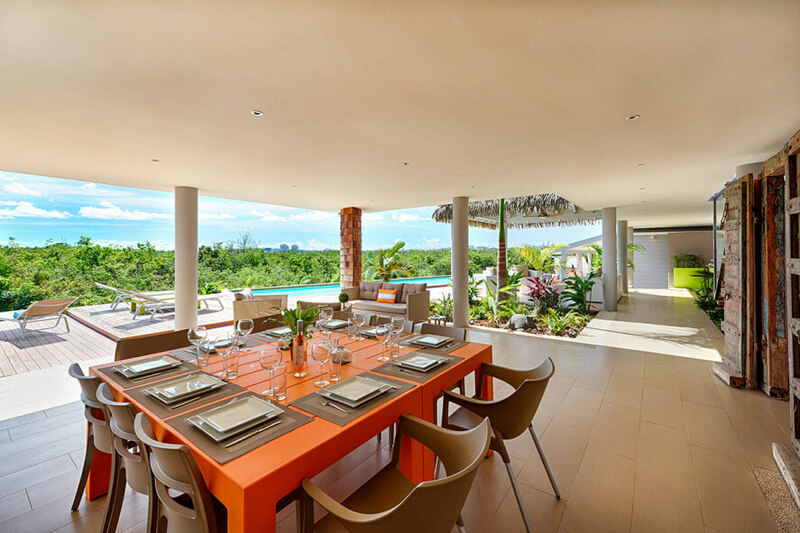 A covered al-fresco dining table located pool side compliments the open concept interior living space with its playful and fun vibe. 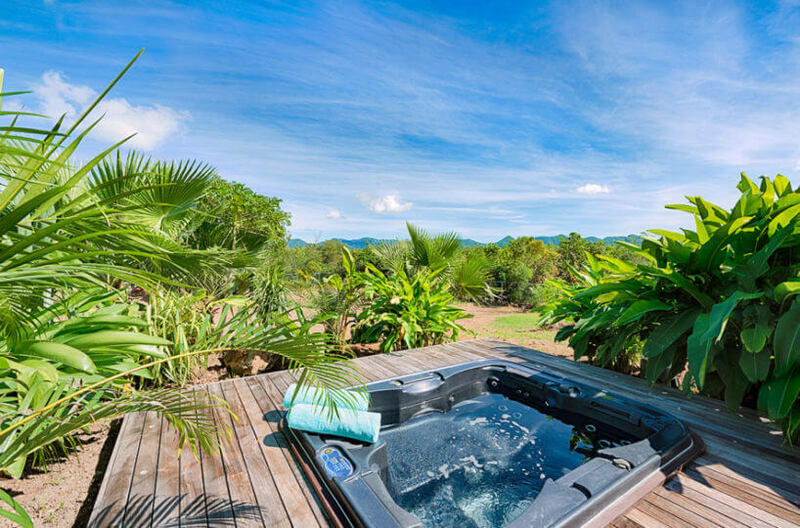 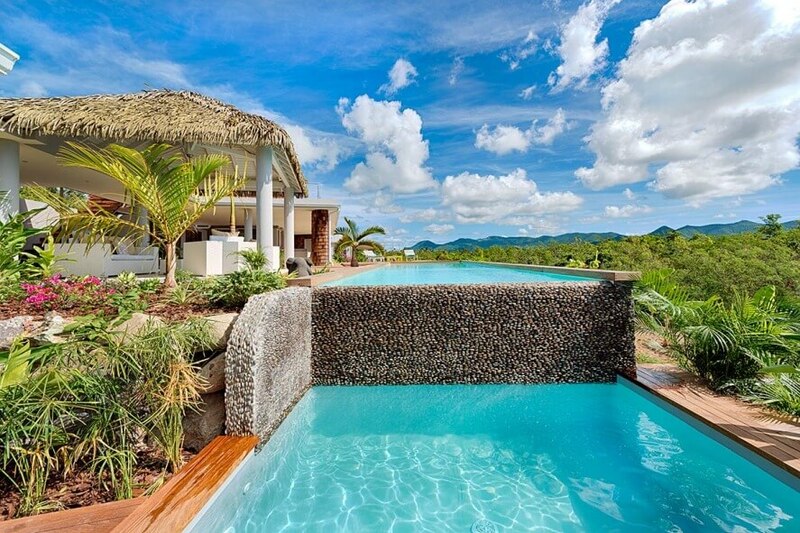 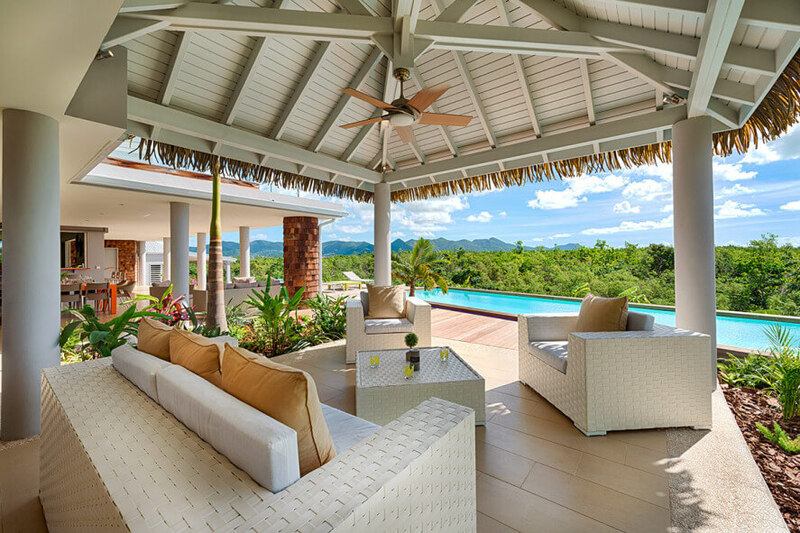 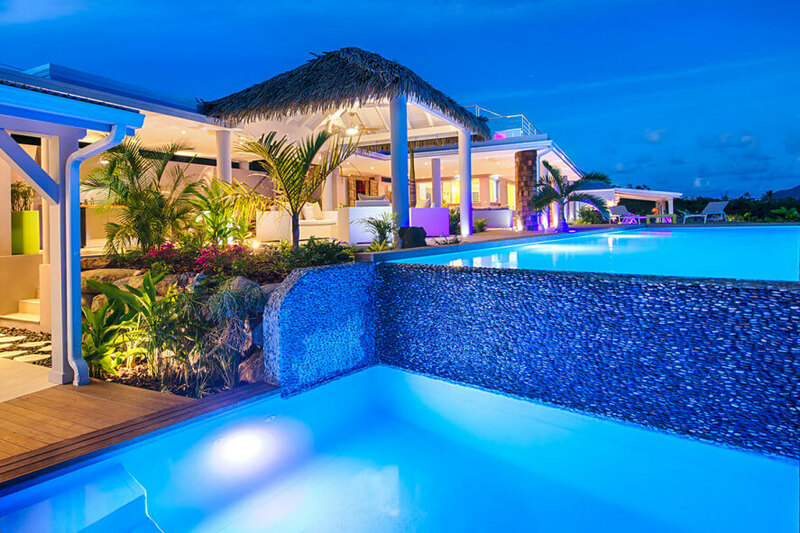 Villa Bahia has several outdoor areas for total privacy. The rooftop patio, the separate seating area’s at the pool and a third seating area outside one of the bedrooms with a splash/plunge pool which runs of the main pool.